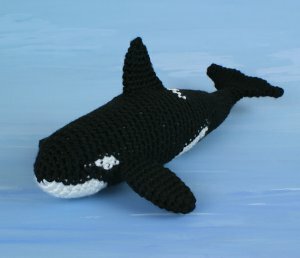 An original crochet amigurumi Orca (Killer Whale) pattern by June Gilbank. Although it is worked in pure amigurumi-style (it uses only single crochet stitches with increases and decreases), this is an intermediate level pattern, as it includes a lot of colour changing to create the beautiful smooth killer whale markings down the entire underside of the body. This is a pattern that requires concentration! The pattern notes include bonus tips to make your colour changes look as good as possible. The pattern includes full instructions and detailed step-by-step photographs with explanations so you can crochet and assemble a perfect orca of your own. Date Added: 05/09/2014 by Rebecca D.
Date Added: 09/26/2013 by Monica B. Date Added: 06/27/2013 by Susanna V.
Date Added: 05/07/2013 by Kathryn P.
Date Added: 04/23/2013 by Kim W.
Date Added: 03/28/2013 by Crystal V.